Aris (full name Athletic Club Aris Thessaloniki 1914) or Aris Thessaloniki FC 1914 (as known in European competitions) are a Greek football club based in the city of Thessaloniki in the region of Macedonia in northern Greece. Created in 1914 as Aris Thessaloniki Football Club, the club was a founding member of the Macedonian Football Clubs Association as well as the Hellenic Football Federation. The colours of the club are yellow of glory, a dominant colour in the culture of Macedonia because of the Byzantine heritage of Thessaloniki, and black. The club is named after Ares, the ancient Olympian “God of War”, who is associated with courage and masculinity. His image is illustrated on the club logo. Nicknamed God of War, Aris was one of the strongest and most popular teams in Greece during the Interwar period. They have been champions of Greece 3 times but not since the mid fourtees. They won the Greek Cup once in 1970 and have remained undefeated at home in European competitions since 1968, a run of 26 home matches. Promoted as champions of Group 1 in the Gamma Ethniki (third tier), Aris will start the 2016/17 season in the Football League, the second highest division in Greece after the Superleague. Aris lost just one game all season, winning Group 1 by 19 points. 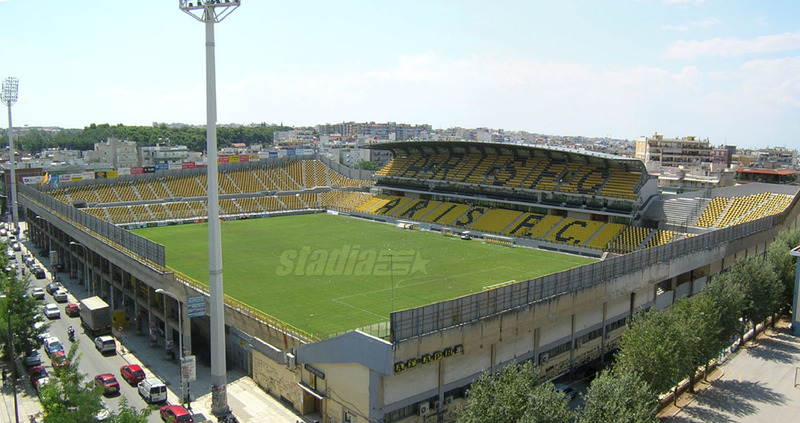 Aris play their home fixtures at the Kleanthis Vikelidis Stadium (also known as the Harilaou Ground), a football stadium in Thessaloniki, Greece. Yellow of glory and black form the colours of the home kit, an important colour scheme to the heritage of the region.